I recently posted an article: Neil Armstrong's Heartbeat - EKG Up For Auction. Unsurprisingly many other news sources have featured the same story, after all, this is a unique item. Or is it? Maybe it is merely almost but not quite unique. You see, PC mag has published the same news, but with a different image. 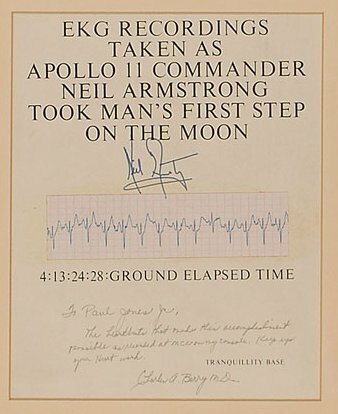 The item being sold by RR Auction and the item depicted by PC mag each purports to be Neil Armstrong's EKG as he stepped onto the Moon at 4:13:24:28. Compare the RR Auction and the PC mag images. Do you notice anything different about them? Is there a battle of the provenances looming? EKG, ecg, electrocardiogram, electrocardiograph, call it what you will: Neil Armstrong (presumably) did not have two hearts, and was never cloned.